This department of sociological studies should evidently be, as far as possible, concrete in treatment. If it is to appeal to practical men and civic workers, it is important that the methods advocated for the systematic study of cities, and as underlying fruitful action, be not merely the product of the study, but rather be those which may be acquired in course of local observation and practical effort. My problem is thus to outline such general ideas as may naturally crystallise from the experience of any moderately-travelled observer of varied interests; so that his observation of city after city, now panoramic and impressionist, again detailed, should gradually develop towards an orderly Regional Survey. This point of view has next to be correlated with the corresponding practical experience, that which may be acquired through some varied experiences of citizenship, and thence rise toward a larger and more orderly conception of civic action—as Regional Service. 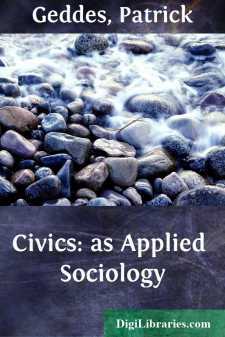 In a word, then, Applied Sociology in general, or Civics, as one of its main departments, may be defined as the application of Social Survey to Social Service. In this complex field of study as in simpler preliminary ones, our everyday experiences and commonsense interpretations gradually become more systematic, that is, begin to assume a scientific character; while our activities, in becoming more orderly and comprehensive, similarly approximate towards art. Thus there is emerging more and more clearly for sociological studies in general, for their concrete fields of application in city after city, the conception of a scientific centre of observation and record on the one hand, and of a corresponding centre of experimental endeavour on the other—in short of Sociological Observatory and Sociological Laboratory, and of these as increasingly co-ordinated. Indeed, is not such association of observations and experiments, are not such institutions actually incipient here and elsewhere? I need not multiply instances of the correlation of science and art, as of chemistry with agriculture, or biology with medicine. Yet, on the strictly sociological plane and in civic application they are as yet less generally evident, though such obvious connections as that of vital statistics with hygienic administration, that of commercial statistics with politics, are becoming recognised by all. In the paper with which this Society's work lately opened, the intimate connection between a scientific demography and a practical eugenics has been clearly set forth. But this study of the community in the aggregate finds its natural parallel and complement in the study of the community as an integrate, with material and immaterial structures and functions, which we call the City. Correspondingly, the improvement of the individuals of the community, which is the aim of eugenics, involves a corresponding civic progress. Using (for the moment at least) a parallel nomenclature, we see that the sociologist is concerned not only with "demography" but with "politography," and that "eugenics" is inseparable from "politogenics." For the struggle for existence, though observed mainly from the side of its individuals by the demographer, is not only an intra-civic but an inter-civic process; and if so, ameliorative selection, now clearly sought for the individuals in detail as eugenics, is inseparable from a corresponding civic art—a literal "Eupolitogenics."